Mythbusting booze: Hair of the dog – hangover cure or excuse for alcoholism? This is the second part in a series about the myths and realities of alcohol consumption. The idea that alcohol may itself be a cure for alcohol hangovers is something that most people would have heard. “Hair of the dog”. Could it have any truth to it? It’s certainly popular: A glance at twitter shows that people all around the world are talking about needing some “hair of the dog” every minute of the day and a survey of college students revealed that 25% reported using alcohol as a hangover cure. A google search reveals a lot of sites recommending “hair of the dog” — many of them supplying less than plausible explanations of how it might work. The first thing worth mentioning here is that there hasn’t been an enormous amount of research into hangovers. An editorial in the journal Current Drug Abuse Reviews outlined the state of the literature as follows. Although the vast majority of excessive drinkers do experience alcohol hangovers, the scientific community has paid little attention to its pathology and possible treatment. This can be explained by the fact that physicians do not view hangover as a disease, but as a consequence of unwanted behavior. In fact, alcohol hangover can be easily prevented by moderating alcohol consumption. Moreover, finding a cure for hangovers might result in more excessive drinking episodes. This makes treating alcohol hangover a controversial topic. That said, there has been some relevant work. 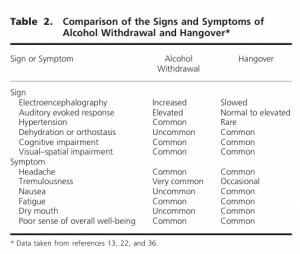 A recent review in a prominent journal considered the possibility that the hangover is an early stage of alcohol withdrawal. If that were the case, then hair of the dog would make sense. Consuming more alcohol would eleviate withdrawal the way that small doses of opiates eleviate opiate withdrawal, or having a cigarette relieves nicotine withdrawal. Borrowed from The Annals of Internal Medicine. As far as I can tell, that’s the extent of the research directly relevant to the matter. Systematic reviews have shown that no hangover cures have been proven to work — but that doesn’t mean they don’t. As I’ve said, very little research has been done and they usually focus on obviously bogus commercial “miracle” cures. A priori, some explanations seem to make some sense. One simple one is that perhaps getting drunk simply makes you forget that you’ve got a hangover. The well-known analgesic effects of alcohol might help with some of the symptoms and the cognitive impairment might make you notice the other symptoms less. Of course, this is a completely unsubstantiated claim. It’s also very plausible that hair of the dog simply doesn’t work and, as one editorialist suggested, is simply an excuse for early stage alcoholism. Mythbusting booze: Absorbing alcohol through feet?!? Fish oil: Bogus or not? Detoxicated helps me to drink without any fear. I don’t get hangovers when I take these pills, and they are by far the best hangover cure I’ve ever tried. How To Get Rid Of A Hangover The Right Way!